1757 and June 1765 he studied at St. Andrews, Glasgow, and Edinburgh before he emigrated to Philadelphia. He was employed as a Latin tutor at the College of Philadelphia for a time before he decided to take up the law under the tutelage of John Dickinson. He was admitted to the Bar in November 1767. He began his practice in Reading, Pennsylvania before moving to the more Scots-Irish town of Carlisle in 1771. There he quickly began a thriving practice in Cumberland County and seven neighboring counties. By 1774 he was well known and respected; in July of that year, when Carlisle came to open a committee on correspondence, he was named as its head and also elected to represent the town at the first provincial conference in Philadelphia. At that time he was a Whig and on the extreme wing of that party, but his future career would see him become steadily more conservative. At the outbreak of war in May 1775, Wilson was elected to the Continental Congress. Hard working and an impressive figure at well over six feet tall, he served on several important committees and urged careful consideration of moves towards independence. He helped John Dickinson delay the July declaration, but three weeks later he approved and signed the Declaration of Independence. His industrious service in the running of the new national government probably helped his shift to the right, a movement that brought him into direct conflict with the new constitution of his home state and led to his removed from Congress in September 1777. His political transformation became complete as he reestablished himself in Pennsylvania; he took up residence in Philadelphia, left the Presbyterians to became an Episcopalian, and joined the Republican Society. Most conservatives, many of them open to the popular charge of war-profiteering, were taking a risk in remaining in a radical city, and Wilson himself had to defend his home in October 1779 from the city militia that came to expel him and his friends from the capital. Removed from politics until the conservatives regained some power in the state, Wilson devoted himself to an array of business endeavors and land speculations. 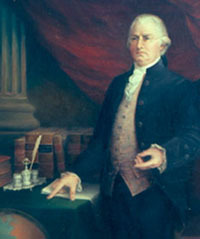 By 1787, Wilson had returned to Congress and had been appointed a delegate to the Constitutional Convention. Here his experience and his learning were invaluable as he was an important member of the committee that actually drafted the details of the document. His efforts were then turned to the ratification convention in his home state. These led to his effigy being burned in the town where he had made his early mark in the law. The success of the reactionaries in Pennsylvania was complete, however, when Wilson almost single handedly put together the new state constitution in 1790. Under newly elected President Washington, Wilson was named an associate justice of the Supreme Court in 1789, a position he retained until his death. In that same year, he became the College of Philadelphia's first professor of law. Meanwhile, his personal wealth, which had already suffered damage from three years of tireless efforts to secure new constitutions for nation and state, continued to deteriorate. His hasty land speculation in New York and Pennsylvania failed, and Wilson slipped into an indebtedness that would last the remainder of his life. As a friend of William Bingham and others in Philadelphia, and as trustee of the Carlisle Grammar School from its founding in March 1773, Wilson joined as a founding member of the board of the new college in Carlisle, named for his first mentor in the law. He remained a member of the Dickinson College board from its inception in 1783 until his death. James Wilson married Rachel Bird of Reading on November 5, 1771, and the couple had six children before her death in 1786. In September 1793, Wilson married nineteen-year-old Hannah Gray. Their son died in infancy, and Wilson came under increasing mental pressure as debt collectors began to pursue him and efforts were made to impeach him from the bench. James Wilson died on August 21, 1798 while staying at the home of friend and fellow justice James Iredell in Edenton, North Carolina. He was fifty-six years old. Looking for more information about James Wilson?